Connect your blu-ray player, gaming console or other HD device to an HDTV. 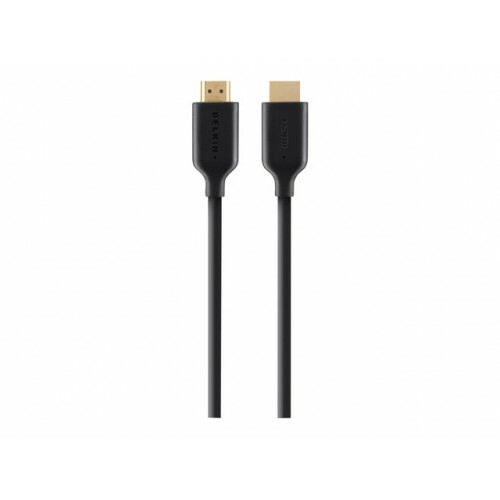 The Belkin HDMI cable with ethernet is perfect for connecting Wi-Fi enabled devices to your nternet-enabled HDTV to stream movies, listen to music and view content. Works with, Mac, MacBook, Tablets, Laptops/Ultrabook, Apple TV, Mac mini, Game consoles, Blu-ray/DVD players. The Belkin HDMI cable with ethernet supports full HD (1080p) as well as ultra HD (4K) displays. Please note: To take advantage of 4K resolution, your connected device must have a mini displayport 1.2 or be thunderbolt 2 technology ready.